AutoZone stands to benefit as miles driven increases, but what happens when cars become too complex for do-it-yourself consumers? While many investors within the energy sector have been pummeled thanks to cheap oil, one company that stands to benefit indirectly is AutoZone (NYSE:AZO). AutoZone generates a majority of its revenue from consumers buying auto parts to fix cars independently, the do-it-yourself (DIY) crowd, and when miles driven climbs higher, that equates to more repairs needed. Interactive chart available here. Source: Federal Highway Administration. After plateauing for a few years after the Great Recession, miles driven is increasing once again. While that's good news, and AutoZone does many things well for its investors, there is one hurdle the company faces. Let's look at what AutoZone has to offer its investors and what those investors should watch if they decide to own shares. Some companies opt to return value to shareholders through dividends, and some prefer to reduce the outstanding share count to help boost earnings per share -- and many companies do both. 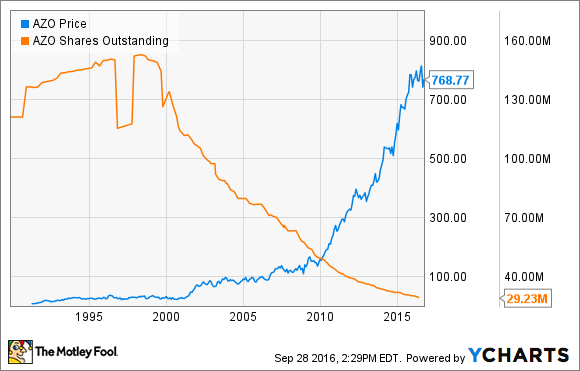 AutoZone, however, sets itself apart from most companies with how many shares it has repurchased over the years. Just last week, AutoZone announced that its board of directors approved an additional $750 million of shares to be repurchased, and since the program began in 1998 it has authorized the repurchase of over $17.9 billion. This helps power earnings per share higher; for instance, AutoZone's full fiscal year 2016 recorded a 6% climb in net income and a 13% rise in earnings per share. In addition to its relentless share buyback program, AutoZone's massive size -- nearly 5,300 stores in the U.S. alone, and 5,814 in total -- provides scale that helps margins remain at high levels. For the full-year fiscal 2016 AutoZone's operating expense ratio declined 24 basis points, its operating profit jumped 5%, and its operating margin checked in at a healthy 19.4%. AutoZone has a lot to offer its investors, but one thing that could be concerning is the trend of vehicles becoming more and more complex. As vehicles become more and more complex, it becomes difficult for the average consumer to fix problems themselves. Heck, many estimates have the percentage of Americans who change their own oil to be less than one-third of the population, and that could continue to decline. As engines grow more complex and computer based, the pool of DIY consumers could shrink, directly affecting AutoZone's core business. However, as any great company would, AutoZone sees this as an opportunity. Currently, AutoZone trails its competitors Advance Auto Parts and O'Reilly Automotive in commercial business -- consisting of consumers who bring a car in for the shop to repair, a.k.a. the do-it-for-me crowd -- but it's focused on improving this portion of its business. If AutoZone is successful in doing so, it would help negate the fact that more consumers can't independently purchase products and repair their vehicles. Looking at the fourth quarter, AutoZone increased its number of commercial programs by 6%, compared with the prior year. Better yet, for the full year of fiscal 2016, it increased its commercial sales by 7.1%. There's still much room to run, though, as commercial sales still generate less than 20% of the company's top-line revenue. The bottom line is that AutoZone has a lot to offer investors, and it's even more resilient to recessions than most retailers as more people will try to repair their vehicles with AutoZone products than pay for more expensive mechanic bills. But the trend of increasingly complex cars isn't going to reverse, and if AutoZone can't accelerate its commercial business to match or, better yet, exceed its competitors, it's a red flag for long-term investors.